Readers above a certain age can probably still remember what a pain it was to dial some phone numbers on rotary dial phones. Numbers with a lot of 9s and 0s were the worst and took forever. It was a relief when touch-tone phones became the norm, and plenty of us vowed never to use a rotary phone again. But UP Digital Bureau and Unteleported Tech Agency created the Tweephone despite all of that. The dial spells out whatever you want to tweet (with a little help from your dialing finger, of course) and you just hang up to send the tweet to the Tweephone Twitter feed. The phone is the world’s first analog Twitter client. 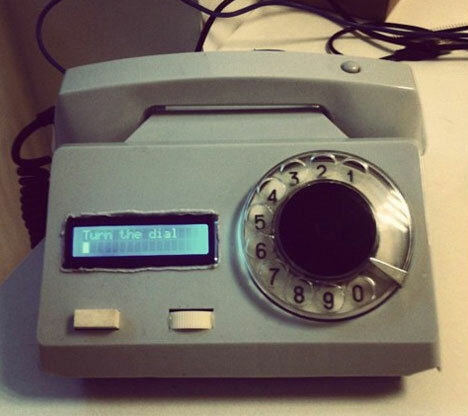 You use the dial to spell out the letters you want to use just like with a touch-tone phone, dialing each number multiple times until the desired letter is selected. Given the irritatingly long time this takes, it’s not hard to see why most of the current tweets from the Tweephone are so short. Not only did the collective build this Tweephone; they also generously share the source codes so that anyone can rip apart Grandma’s old phone to make their own.